Looking for an easy way for your users to become members of your site ? Look no more because login box with facebook support has it all. 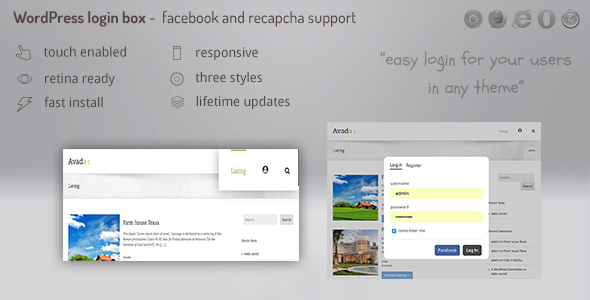 Two click login, optional recapcha integration, even Buddypress extra register fields. Just drag into your menu like any other menu item. Choose from login box, login button, or register button. All of these will summon the login box, but will go to login or register as requested. Also can be integrated in content via shortcode. .. for showing the login text. Choose style for account button, login button, register button. Each from the three predefined settings. Or add your own css easily if you have css knowledge.